A forgettable exploration adventure that could have been so much more. Sometimes, you can tell a developer has all the best intentions and a decent template for a game, but the pieces just don’t come together for the final product, resulting in a disappointment. That’s exactly what I found with Planet RIX-13, in that there’s nothing inherently wrong here and it has a solid premise as a survival adventure title, but nothing about it really felt like it was worth my time. You’ll start out as a space-suited character who has survived their ship crashing on an alien planet and sets out to discover its mysteries and find a way back home. After an initial text box you’re told to go and find a way to heal yourself (as your character is limping), and almost immediately you’ll find a medical pod, which acts as an unfortunate indicator of the game’s linear structure and easy difficulty. The medical pod is found in a laboratory you can poke around in, in somewhat traditional point ‘n’ click fashion (you move your character from left to right and press x to interact with an object once you’re stood in front of it) and this is where Planet RIX-13’s structure begins to show – turning on computers will reveal new locations to explore out on the planet, but certain objects in the lab are broken and you’ll need to flit between all these different areas to find other items in order to fix the broken ones. This is then repeated until you’ve found a way to get off the planet. There are plenty of hazards along the way; some areas will be radiated, so you’ll need to find a special suit in order to not immediately die, while others have low oxygen, meaning you’ll need a mask to breathe. The problem is that these ideas are introduced and almost instantly resolved – you might read a computer entry telling you there’s a cave nearby with low oxygen, but then right next to the computer is a schematic to use in the 3D printer to produce an oxygen mask. I rarely had to engage my brain, which is a surprise given the genre. Those instances where I did have to think a little more mostly involved remembering which location on the map had the machine I needed (you do make automatic notes of certain events which can be accessed at any time, but as these are automated they won’t always record what you want). Other than that, everything is fairly straightforward; you’ll visit an area, retrieve an item, then use it in a second location to get the clue to go somewhere else. Even a couple of safes early on that I thought might contain hidden secrets just turned out to be part of the overall progression and were easily opened as the game basically gives you the combinations. There is a definite effort to tell a story and build a world, so there were a few moments where I felt engrossed in Planet RIX-13’s atmosphere. Most of that comes from logbook entries but sadly these are just far too brief to realistically set any kind of mood, while the areas you look around are fairly small, which again stifles their ability to convey an atmosphere. It’s worth noting that the story ends on a bizarre note as well – I suspect there was supposed to be a hell of a lot more but it got cut for whatever reason. In terms of presentation, the game looks decent enough, the problem is just that the game's pixel graphic style is a dime a dozen in the current gaming market and there’s nothing about it that stands out at all. That’s exacerbated by the lack of a soundtrack (which is always a big deal in a game for me), although the sound effects do work pretty well and obviously the silence is meant to add to the dark tone. 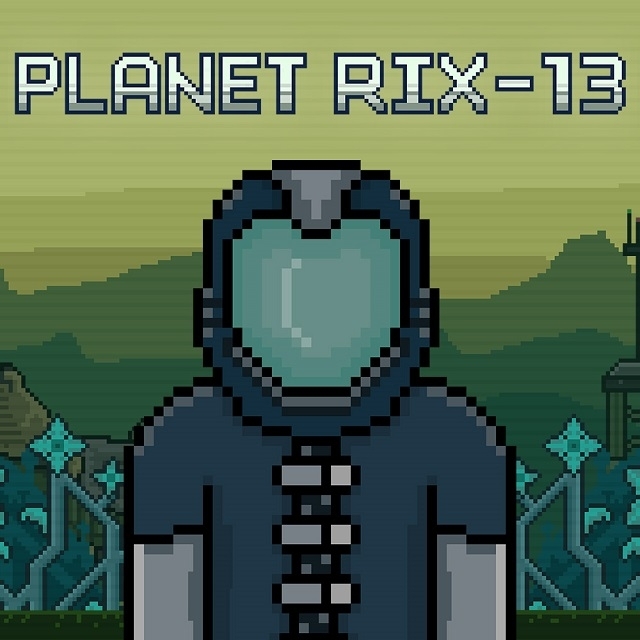 At least Planet RIX-13 runs well – on Vita the load times were almost non-existent and there were no performance issues. The biggest kicker for me about Planet RIX-13 is that it’s over in the blink of an eye – it took me a little over 40 minutes to finish the first time around, and although there is a second ending it isn't really worth seeing (and only takes a further 20 minutes to obtain anyway). An hour of playtime is weak, although I would note the game is generous with trophies and this was a particularly easy platinum to get. Overall, Planet RIX-13 is a forgettable exploration adventure that could have been so much more - it presents an interesting premise that it never manages to capitalise on. It has distraction value if you’re a massive fan of point ‘n’ click games, but otherwise this isn’t a title I can really recommend. This review is based on a digital copy of Planet RIX-13 for the PSV, provided by the publisher.